Herbie is lonely. His parents moved to a space station in the middle of nowhere, and there's nothing to do. He spends a lot of time wandering in the ship's ventilator shafts, and if he wants to have any friends, he has to build them out of spare parts. Deep inside the ship, Herbie discovers that a herd of gobblings have landed--monsters who float through space and love to eat metal. And the closest and biggest hunk of metal is the space station they live on. The gobblings are crawling throughout the ship, ready to make it their dinner, and Herbie's the only one who can stop them! 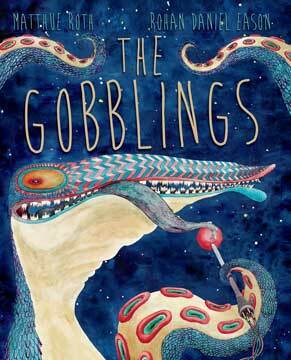 The Gobblings is a loose retelling of an old Hasidic folktale, "The Alef Bet." A boy is wandering through a strange town where he doesn't know anybody. It's Yom Kippur, the Day of Atonement, but nobody's prayers in the entire town are working. The boy only knows the letters of the Hebrew alphabet, the Alef-Bet. So he says the letters, and the honesty and simplicity of his prayer go through the Gates of Heaven (okay, in our story, it's the landing bay on the space station) and save everybody. Matthue Roth was born on Earth, or so his parents insist...though probably in the vicinity of Area 51. His first book, Never Mind the Goldbergs, was a NYPL Best Book for the Teen Age and an ALA Best Books nominee. His latest is My First Kafka: Runaways, Rodents and Giant Bugs. By day, he's a video game designer. He lives in Brooklyn with his family and keeps a secret diary at matthue.com. The illustrations of Rohan Daniel Eason are dark and beautiful, his work on "My First Kafka" being likened to Edmund Gorey and Maurice Sendak. He was shortlisted for the AOI Illustration awards 2013, and runner up in the award for best book illustration, for a piece in "Tancredi" a novel by James Palumbo. His work has recently received broad praise after he illustrated bestselling author, Kate Mosse's 2013 release, "The Mistletoe Bride."